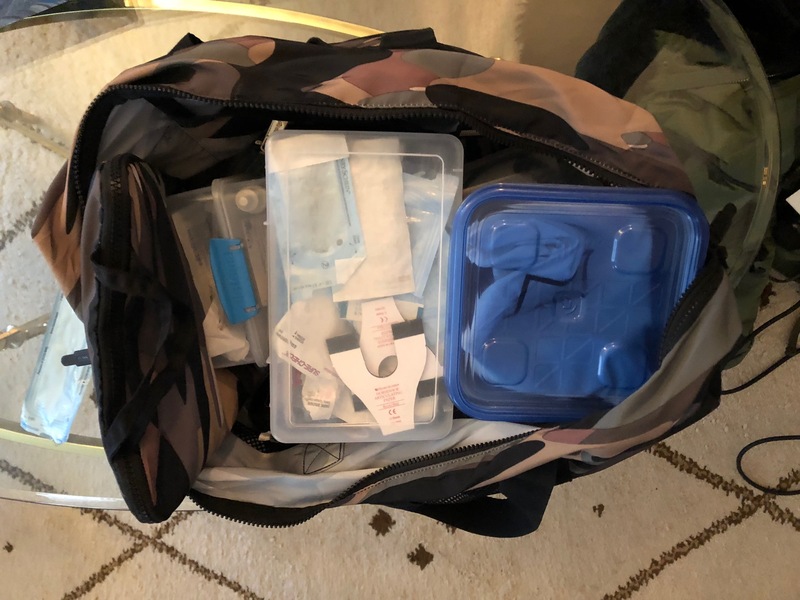 Traveling Dentist Alisa Kauffman carries her tools in a duffel bag, but tools for a root canal won't be found in there, Kauffman says that's one of the limitations to visiting patients at home. The idea of a doctor making a house call seems like something from a bygone era. But one New York City dentist has brought the trend back. Doctor Alisa Kauffman is paying a house call to John and Caroline, an elderly couple who live on Central Park West in Manhattan. Their caretakers Zaiara and Sheila greet her at the door. They walk Doctor Kauffman through an aging apartment and lead the way to John and Caroline who are watching television in their individual easy chairs. John is 88 and struggles to talk. Caroline is 86 and is completely non-verbal now. Kauffman introduces herself to the couple and explains she's there to clean their teeth. She starts by opening her bag, pulling out some tools and putting on some gloves. "This is all I'm going to do, I'm going to open you're mouth and I'm going to look inside," Kauffman tells John, "You don't mind, right?" Kauffman cleans John's teeth for about 25 minutes. She asks John if he feels any pain while she makes her way from one side of his mouth to the other. When she's finished she begins to work on Caroline. Caretakers Zaiara and Sheila already explained Caroline has gaps between her back teeth making it hard to chew all her food. "That's the huge gap, is that what you're talking about?" Kauffman asks Caroline's caretakers, "That's a sin, if she could she would clean that every time she eats." Kauffman spends time cleaning each of Caroline's teeth. She says Caroline's gums are inflamed and her teeth need to be brushed more regularly. But its hard because Caroline can't open her mouth by herself. Kauffman shows caretakers Zaiara and Sheila how they should be brushing Caroline's teeth. She even gives them a special tooth brush to practice on themselves. Kauffman says most of her patients are like John and Caroline who can't leave their home because of physical limitations. "Probably eighty percent of my patients have dimentia," Kauffman says, "The average age of my patient is 90." Kauffman says she started making house calls right out of college when her friend's father had a stroke and couldn't leave the house. She says one patient turned into another until she eventually sold her practice and started making house calls full time in 2000. She says she wants her patients to hold on to their quality of life for as long as possible. Kauffman says she tries to have fun with her patients while also giving them the respect they deserve. "I just want to treat people the way I would want my parents to be treat," Kauffman says, "I like to treat people with dignity and have them feel like someone cares about them." Kauffman says she's surprised there aren't more dentists who are making house calls. She also teaches dentistry and she hopes to inspire her students to follow in her footsteps.